After lunch everyone met back up near the tree that stands at the end of Pike Place Market , at Virginia and Pike. From there we moved in a more or less northwesterish direction to Lenora Street and took that to 5th Avenue. 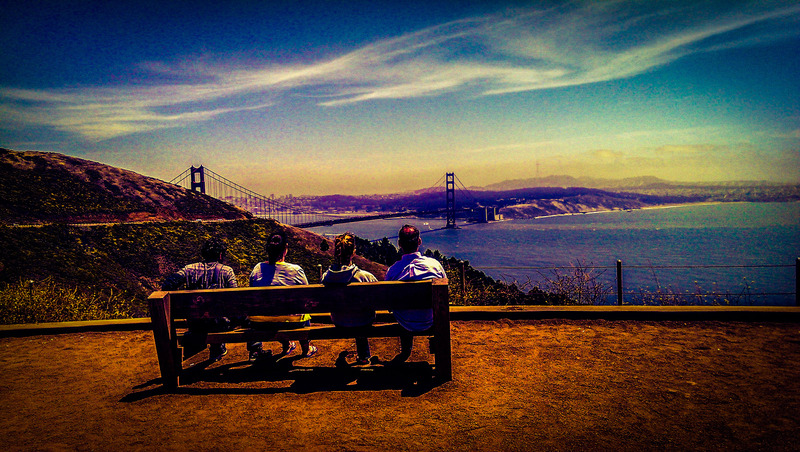 Whether it was the time of day, the angle of the sun, the breeze off the bay, our sheer exhaustion or the city itself, this was a beautiful walk. Seattle surprised us all by being clean. I’m not sure why were surprised, maybe Portland lowered our expectations of every city, but we were. Along 5th we walked in the shadow of the monorail line, but unlike most areas we’d walked through in Chicago or New York, this elevated train line didn’t detract from the buildings around it. Businesses and real estate didn’t suffer for being near the line. Except for the immigration office, or law firm, whatever it was. I don’t think anyone really cared much about that place, though. Or you know what? It may have made that monorail cooler. There were boutique shops and restaurant, fountains and coffee shops, a glass blower, all along this street. I understand, the monorail has a smaller footprint than a full blown elevated train line and since it services a significantly more limited area its reach isn’t as great. It may not be fair to compare the aesthetic or economic effects of a monorail to an L. And this one, I believe, only dates back to the 1960s, so NYC and Chicago have a hundred years of blight and decay on Seattle when it comes to that. Well, you know what? I’m going to compare them anyway. This was a cool walk. You did good Seattle. We saw just the tip for a moment and it was gone. We were so close! 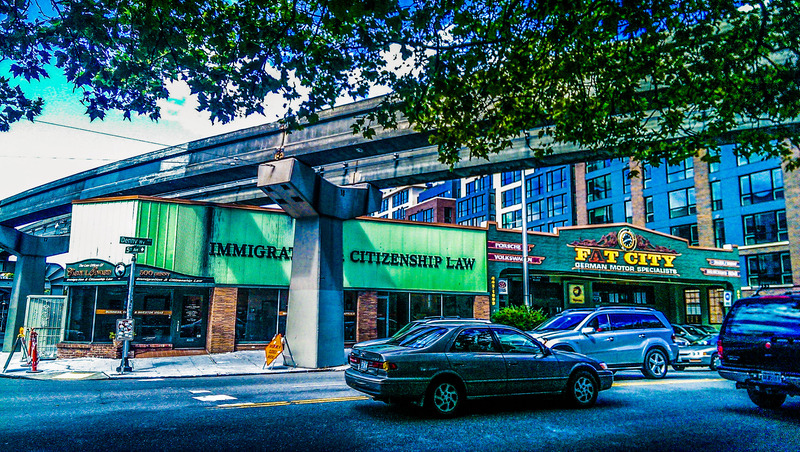 The monorail line curved away from us and we turned onto Denny Way for a moment until at 4th Avenue we turned again. Then there it was again and this time we got a good view. The Space Needle was really cool, and we only saw the outside of it and the gift shop. Honestly, I’m ok with that. It was $24 to ride up to the top and the wait was a little ridiculous. Would I love to go back and take a ride to the top, maybe have dinner, see the city at night from up there? Of course. I’m cheap, not dead. Who wouldn’t want to do that? 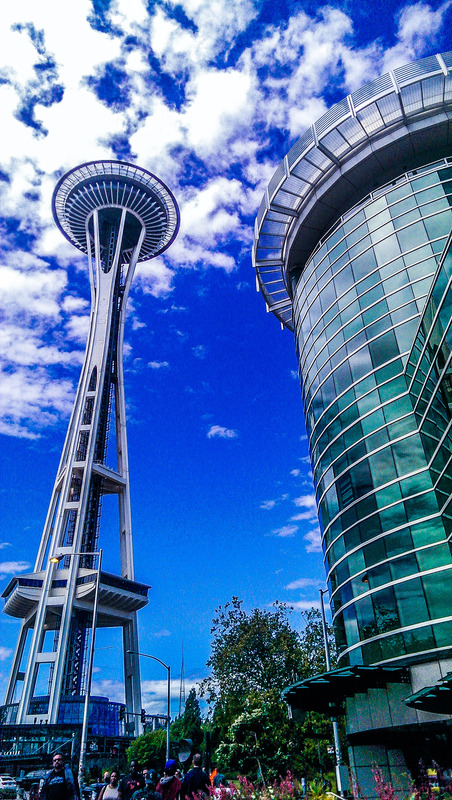 Instead, we spent a lot of time in the gift shop and took some great pictures inside and out of the Space Needle. Would it have been great to take some shots of the city from up there? Absolutely. Do I feel like I missed out on something because we didn’t? Nope. Besides, that Space Needle t-shirt was expensive. Around the Space Needle has a great amusement park feel to it. There are more souvenir shops; one Seattle-themed, another Northwest-themed, and also what I thought to be a third cleverly named shop but, in fact, was the actual monorail station. Nearest the Space Needle is the Chihuly Garden and Glass exhibition hall, featuring a massive suspended glass sculpture. 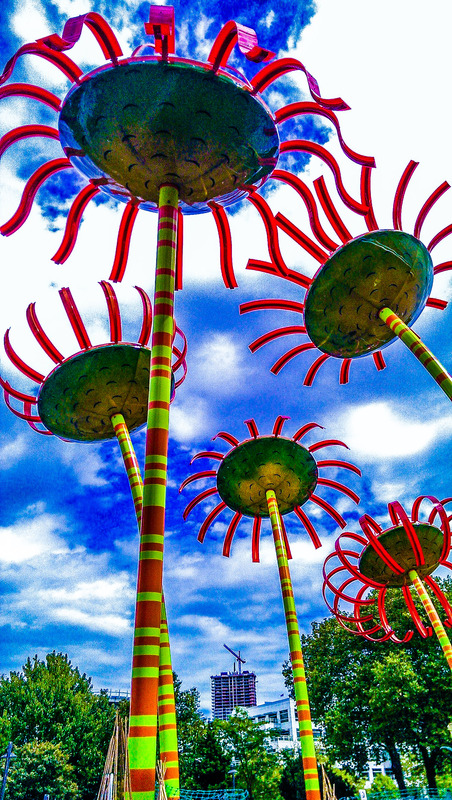 Just outside is an art installation called Sonic Bloom, comprising of massive Dr. Seuss-like flowers that collect solar power to glow at night and will also generate harmonic tones as you walk around them, giving them a cool interactive quality. Beyond the glass museum was an amphitheater, an IMAX theater, the Kobe Bell (which I don’t think any of us got around to seeing) and tons of people. Tons. For everything that was in this area, there was still a lot of open space, great for picnics, field trips, I think some kids had a soccer game going. We caught the monorail back down 5th Avenue and started walking again, hitting a disappointing patch of Chinatown and then stopping into CenturyLink Field to say hi to Richard Sherman before heading over to the Pyramid Alehouse. It turned out, this was directly across from the ballpark. It also turned out, that this is when things started to get a little hazy for me. I can say, however, that there was definitely a baseball game at some point, after which, the Mariners were nice enough to put on a fireworks show for us. I assume it was for us. Why else would they have fireworks? Obviously, it was to celebrate the conclusion of our trip. I guess I could be wrong. After leaving Safeco Field it was a short walk in the misty Seattle rain to the train station and a somber ride back to Tukwila for our cars. The ride was somber for a lot of reasons. Most of which are none of your damn business. But we knew the night was winding down, that the trip was coming to a close. Kevin and Tony had shipped their beer home already, and in the morning we’d all meet up at the airport to say goodbye to Seattle and Dave (mostly Seattle) and head home. After the disappointment that was Portland, Seattle proved to be a high point of the trip, all of us agreeing that we would love to come back and explore more. Which is great for everyone since Dave is offering free lodging, whether he knows it or not. We eased into Baseball Trip this year and took it easy on the ballgames, giving ourselves the time to explore that we regretted not having on previous trips. Sure, there were times we didn’t like each other much, but that’s completely expected when you cram nine people into two cars for a week, especially with how much Kevin farts. There was beer, karaoke, sea lions, the Golden Gate Bridge, dirty old hippies, dozens of bookstores, beer, hills, dirty young hippies, more hills, more beer and even some baseball. We didn’t do everything we wanted, but we did more than we expected. There wasn’t a dull moment. Of course, with this group of idiots, the same could be said if we’d have hung out in someone’s backyard. That’s what makes Baseball Trip so great; it isn’t the baseball or the driving, it isn’t scaring the locals (or being scared by locals), it isn’t the beer or the crop dusting of entire city blocks. It’s these people, this group, that has evolved and changed so much since that first year when our road trip route was shaped like a chicken wing. C’mon, we’re from Buffalo. What did you expect? And yes, that chicken wing was hot and spicy, just like Nick Markakis’ mom. Sorry, Baseball Trip joke. There’s not one of us who wouldn’t agree with Tony (twice), when he said: Best baseball trip ever you turds! Later losers. See you next year. Posted on June 30, 2014, in Traveling and tagged baseball trip, CenturyLink, chicken wing, Chihuly, Chihuly Garden and Glass, fireworks, monorail, Nick Markakis, Pyramid Alehouse, Richard Sherman, Safeco Field, seattle, Seattle Mariners, Sonic Bloom, Space Needle. Bookmark the permalink. Leave a comment.